Built using VooFoo Studios’ own proprietary game and physics engine, Mantis Burn Racing is a visually stunning, action-packed top-down racing game that combines real-world physics with intuitive controls in highly competitive style races. Mantis Burn Racing is a modern top-down style racing game with incredible depth that combines physics-based gameplay and intuitive arcade racing in highly competitive, fast and addictive races. Get ready to drift, draft, and race your way across stunning tracks in uniquely challenging environments with glorious photo-realistic visuals that truly immerse players in the race. 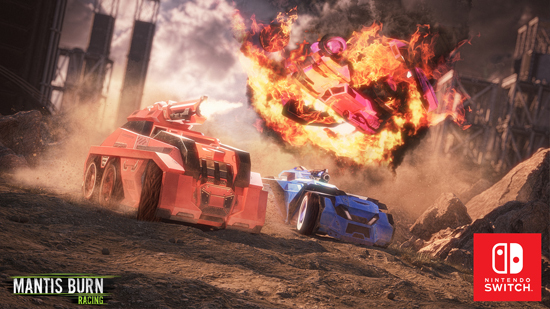 Mantis Burn Racing: £14.99 / $19.99 / €15.99. A modern top-down style racing game that combines physics-based gameplay with intuitive arcade racing in highly competitive, fast and addictive races. Prove your skills in 5 unique classes of vehicles over an epic 11-season single-player career with more than 150 events and 13 event types in frenetic, bumper-to-bumper races where winning is everything! Fine tune your vehicles with a RPG-style upgrade system and compete in split-screen races for up to 4 players or take the race online in „one-more-go‟ style competitive racing. Enjoy the definitive version of Mantis Burn Racing on Nintendo Switch with the super-fast „Elite‟ class vehicles DLC, destructive Battle Cars DLC and treacherous Snowbound tracks, all included. 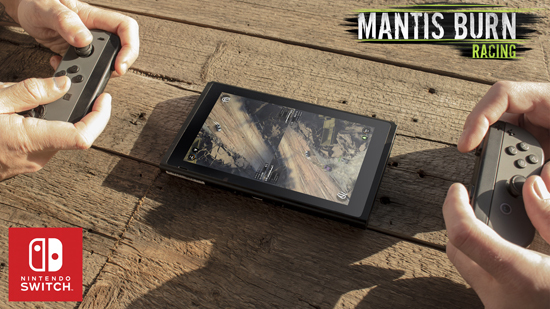 Race Your Way Play Mantis Burn Racing your way, with all new features exclusive to Nintendo Switch. Now you can race anytime, anywhere in local or online races in the definitive version of the game. Immersive top-down Racing Drift, draft, and race your way across 12 stunning tracks in 3 uniquely challenging environments with glorious photo-realistic visuals that truly immerse players in the race. Extensive Career Mode Test every aspect of your driving ability in an extensive 11-season career where you choose your progression path on the road to being crowned Mantis Burn Racing® champion. RPG-Style Upgrades Fine tune your vehicle's handling and performance via a RPG-style upgrade slot system that presents players with deep tactical choices and excellent replay value. Incredible Vehicles Choose from a roster of fully customisable built-for-racing vehicles in 5 distinct categories, each with their own unique handling and performance traits. Split-Screen Multiplayer With up to 4 friends competing on one console in classic couch-style split-screen races. Go Head-to-Head Take on friends in 2-player local split-screen races using individual Joy-Cons with players sitting cross-table at opposite sides of the Switch. Local Wi-Fi Multiplayer Allowing up to 8-players to connect multiple Nintendo Switch consoles together and race each other without the need for a connection to the internet. Race Online Take the race online with up to 8-players and play against opponents on other platforms with Cross-Network play. 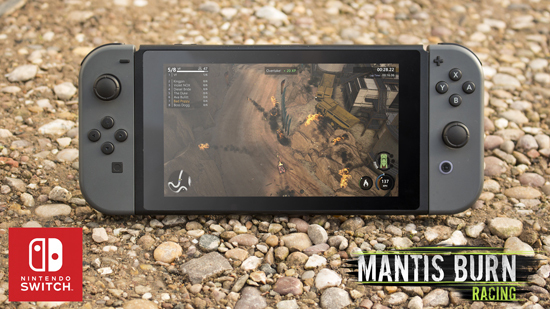 Experience the definitive version of Mantis Burn Racing on Nintendo Switch with super-fast Elite class vehicles, destructive Battle Cars and treacherous Snowbound tracks included.